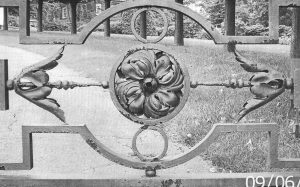 Here are a few more additions to the driveway gate restoration in Cleveland, Ohio. The above leaf (or husk), is 3″ x 12″ x 2-1/2″, of 18 gauge mild steel. 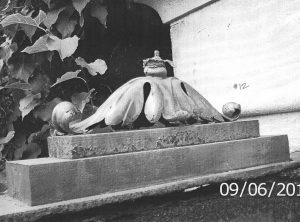 There are two, and they are mounted high on the gate piers. The image above shows the two husks together. The husk on the left was the first piece made. The first piece made of any form offers a learning curve, and this one was no different. As the gates original ornament was machine stamped, I must reproduce them the best I can by hand. The most difficult aspect is getting the volume that the machine stamped piece achieves. 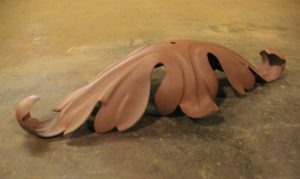 Thus, I sometimes need to alter the look of the piece to accommodate the hand-made aspects, getting as close to the original form as possible to achieve the basic feel of the leaf or husk. Since a machine can apply pressure and shape much of the piece often in one step, some veins made by hand cannot be achieved without much difficulty, and sometimes it is not practical at all to attempt an exact replica. However, in this case, I learned on the first piece…after folding it into the final husk form… that I could likely reproduce the machine stamping in all aspects. If you look closely at the two reproductions above, you will notice how some of the veins do not relate to each other as they terminate. Below, you will see the original husk, and the second reproduction, and how the second piece relates almost exactly to the original. This aspect of reproduction is challenging, though rewarding when one learns from the process of recreating. It expands the knowledge base, and adds confidence. Below is a bird’s-eye view of this form. To achieve this form, all the veins and shoulders were drawn in when the piece was in a semi-finished primary shape. Then, the main center veins were applied, but stopped short of the center, so they wouldn’t be destroyed when folding into the final husk shape. 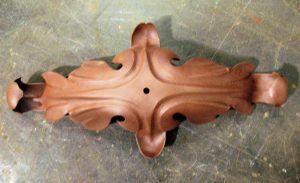 After the final shape had been established and planished, then the center veins were connected and finished…unlike the first piece. Since these pieces are elevated roughly 14 feet from grade, these two pieces appear identical by the audience. Shown above are four rosettes, 8″ in diameter, and full of volume. These will be mounted back to back, i.e. counterclockwise/clockwise, on opposing faces of the gate. There are four of these pieces per gate. Here again, several pieces were made before the process was established to provide the best representation of the original machine stamped form, as seen below. In this case, it was apparent that the exact shape could not be achieved by hand. The form was revised to achieve the primary visual aspects of the original, as applied by hand using the hand rendered repoussé process. The next phase of this restoration will be to reproduce the remaining rosettes, and there are a lot of them. 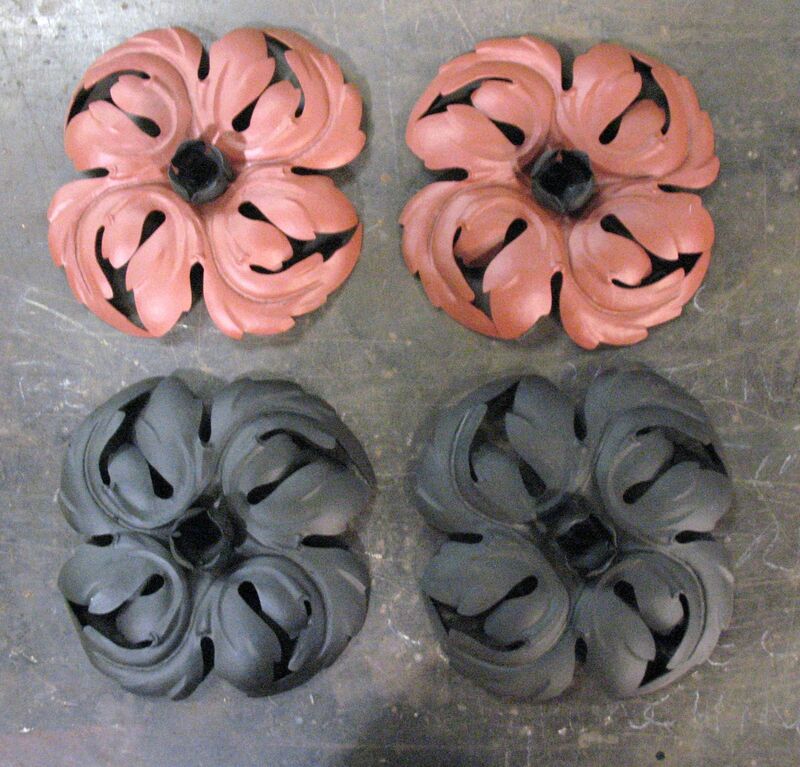 There are 50 more composite rosettes per gate, of which there are three elements each, comprising 150 pieces total. There are also an additional 32 composite rosettes, of which there are two elements each, or 64 pieces total. Finally there are two fine ribbon forms, of which I am saving for last, as there will be quite the learning curve on these forms. I will keep you updated, as this project continues. I am sure Grandpa would be pleased. Just keep it up. And thank you for including me on your email list!